The mainstream financial news and twitter “market experts” have nailed it. The top is in. It’s nice knowing that calling a recession is this easy. There’s really nothing to this game. Buy the dip when the curve is positive and sell when it inverts, sidestepping a recession and bear market. It’s so easy your grandmother could do it. You can probably tell that I don’t quite agree with the above sentiment. Last time I checked, investing and calling macro tops isn’t quite so simple. First, I’ll explain what an inverted yield curve actually means. Then I’ll lay out why there’s almost certainly more upside in stocks (much more). And then I’m going to use the four dirtiest words in finance to explain why context matters in this game, especially now. It’s important because all assets are priced off this curve. When the front end interest rate, which is set by the Fed, rises faster than what the long end is pricing in (ie, it flattens and/or inverts), it impacts markets and the economy in two ways (1) it has a negative present value effect on asset prices and (2) the flatter/negative curve causes a constraint on lending as well as the broader economy. The first one is simple. 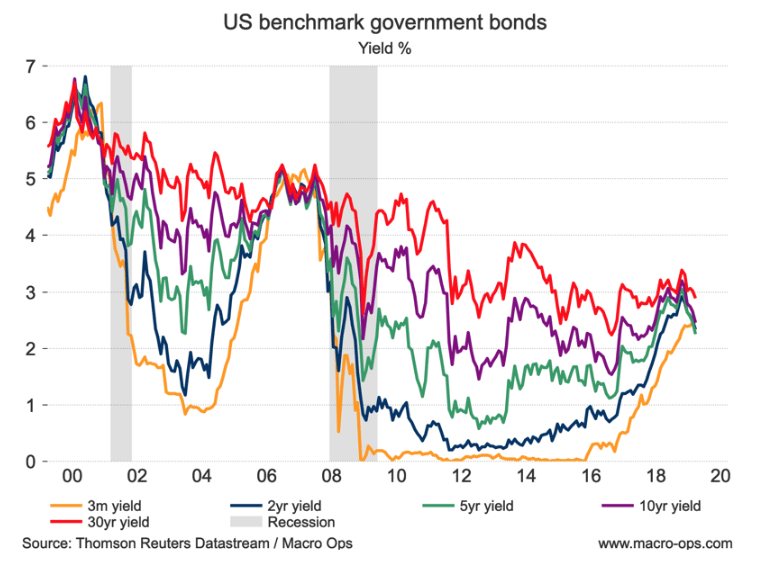 When front end rates become equal to or exceed those of longer end interest rates, moving out of duration assets and into cash/cash-like instruments makes sense (why take on duration risk when you don’t receive compensation for doing so). This applies to stocks as well, as stocks are essentially long-duration assets. Early on in the top, some parts of the credit system suffer, but others remain robust, so it isn’t clear that the economy is weakening. So while the central bank is still raising interest rates and tightening credit, the seeds of the recession are being sown. There’s also a market/Fed disagreement component to a flattening/inverting yield curve which is where the signaling comes from. When front end interest rates (which are set by the Fed) rise above long end rates (which are set by the market) it essentially means that the market disagrees with the central bank. The market is saying that the Fed has gotten ahead of itself and will soon have to reverse course (cut interest rates) due to slower growth and inflation in the future. That’s why investors take on duration even when it’s offering an equal or lower yield than the front end; they expect yields to continue to trend downwards. I’ll explain in a bit why the dynamics of this have changed and why the signaling quality of the curve has deteriorated due to some very explainable reasons. 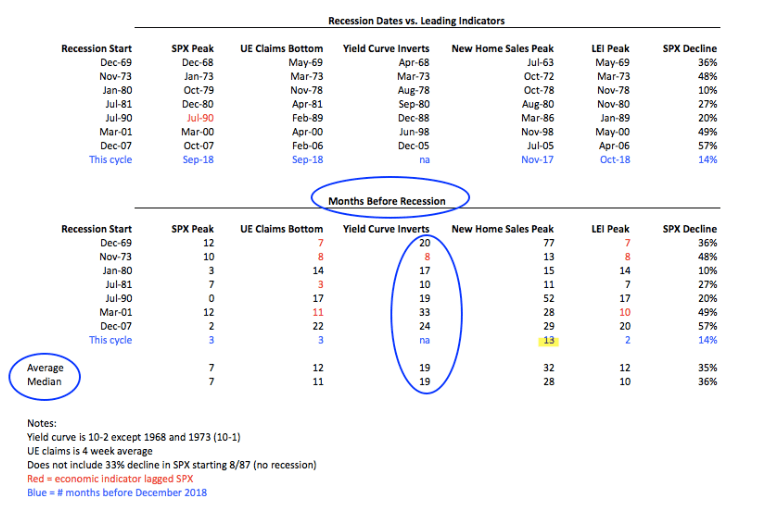 Before we get to that though, I want to show you quickly why even if the recession signaling value of an inverted yield-curve hasn’t been distorted, it’s still no reason to panic over the short-to-intermediate term. 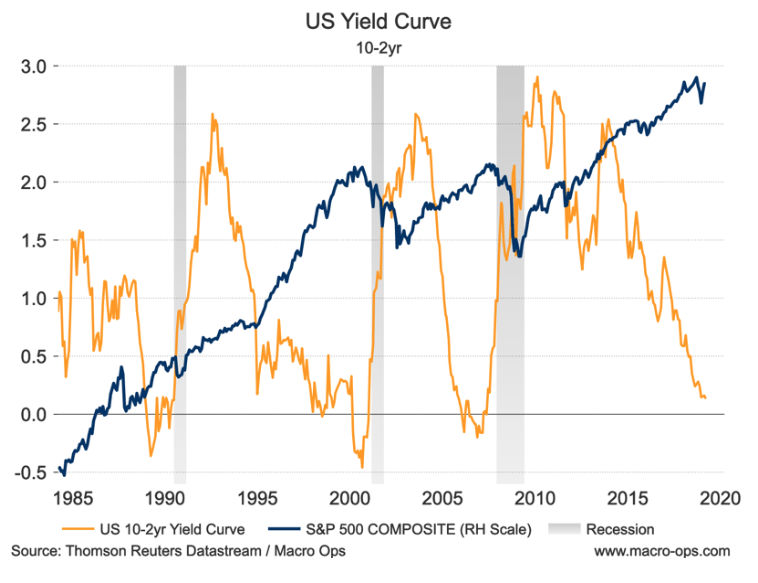 The reason being is that the curve tends to invert well before a recession and depending on which specific curve you’re using, long before a market top as well. See the 10yr/3m curve chart at the top. It inverted years before the last two market tops. 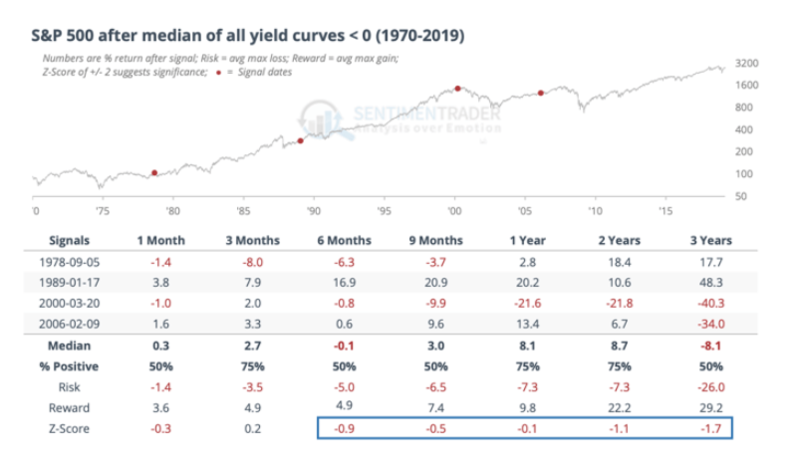 The graph below shows that the standard 10yr/2yr yield curve has inverted on average 19-months before a recession, going back to 1968, whereas a top in the SPX has preceded recession by only an average of 7-months. The 10/2yr curve hasn’t even inverted yet. More importantly, let’s talk context, which is something that so many market commentators seem to not care about. 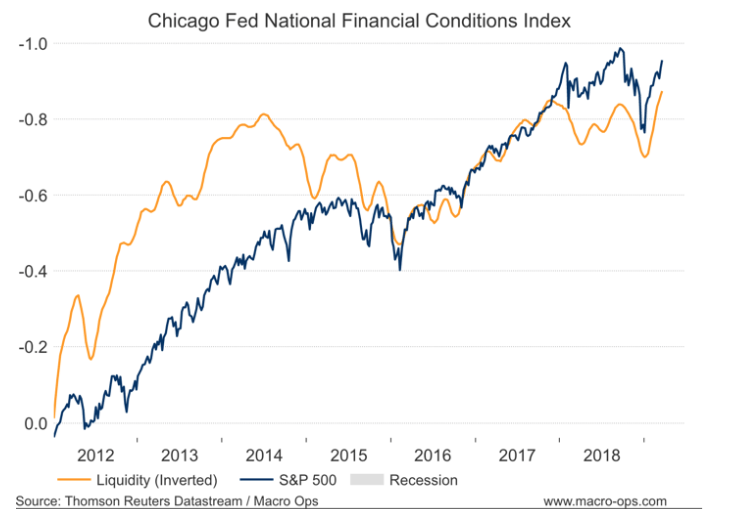 There have been two very important changes this cycle that make present-day conditions unique and the signaling value of the yield curve diminished. Yes… I’m saying This Time is Different. I know, I know, you’re never supposed to utter those words in finance. But excuse me if I think that’s the most overused lazy and abused adage in this game. The truth is, it’s always different this time. No two cycles are exactly alike. So, yes, we still have to use our little monkey brains to try and understand what things like yield curve inversions mean in the context of present-day reality. Let’s start with the first change: Banking and Financial Regulations. Following the GFC new financial regulations (ie, Dodd-Frank & Basel III-IV) were enacted to ensure a more robust and resilient banking system during times of significant market stress. One of the many byproducts of this new regulation is the liquidity coverage requirement (LCR) which requires financial institutions to hold a certain amount of high-quality liquid assets (HQLA) that’s sufficient enough to withstand a significant stress scenario. What this means in practice is that banks have to hold a higher level of HQLAs (ie, sovereign bonds) than before. When you couple this with the need for duration matched assets from pension funds and insurance companies in a world where there’s $10trn+ in negative yielding developed market debt, we get price blind buyers for bonds. And when you have price-insensitive buyers (institutions who buy because they have to) well, the impact on that market’s signaling value should be obvious. Then there’s the second and more recent change, which is within the Fed itself. In practical terms, this means that the Fed has essentially thrown out the models that it’s relied on in past to help make interest rate decisions. Jerome Powell and team are making it clear that they need to see an actual and sustained spike in inflation before raising interest rates. And they’re willing to cut rates and even resume QE to get there, even at near full employment and stable growth. This is a BIG deal. The Fed has learned some lessons from past cycles and doesn’t want to kill the party. So why fight the Fed? I sure don’t want to. Okay, so far I’ve explained what an inverted yield curve typically means along with why things are different this time. I’ve also laid out why context always matters and why one should never just lock onto a single input and form a market view. We want to put as many pieces together in our market puzzle. And most importantly, we need to be weighing the data we see against what’s already being priced in. We need to always be asking ourselves: What’s part of the common narrative and what is the market blind to? So let’s play the common knowledge game. Everybody also knows that global growth has been slowing, for a while now. 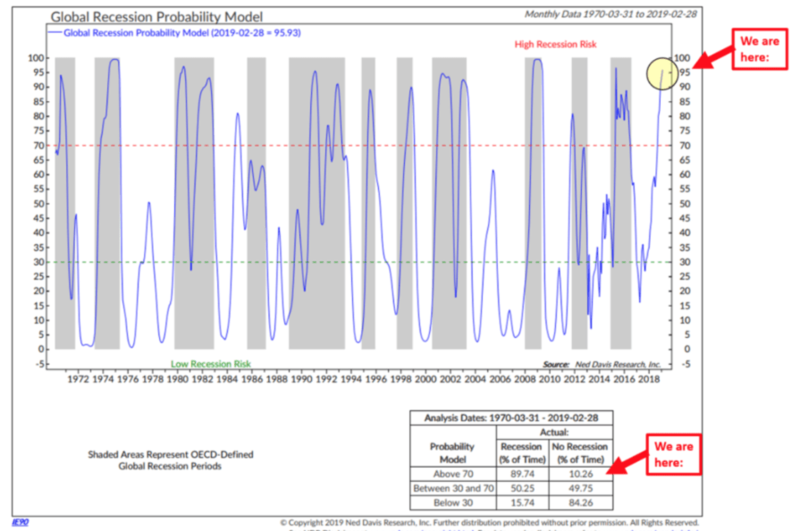 NDR’s Global Recession Probability Model (via CMG Wealth) shows that much of the world has been in recession since the latter part of last year. Most global markets are already reflecting this. 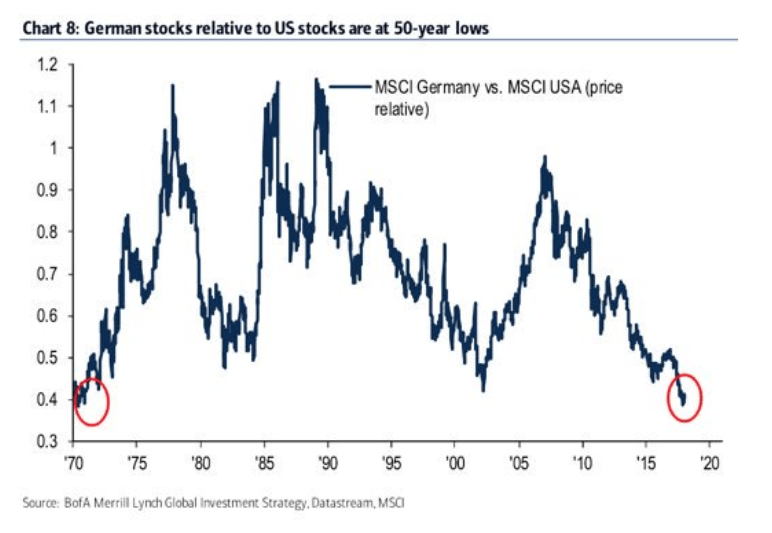 Take Europe for example where German equities are trading at 50-year lows relative to the US. And emerging market stocks spent all of 18’ in a gut-wrenching bear market. There are a number of catalysts which could this. We have the coming 100-year anniversary of the Chinese Communist Party which we believe the CCP will want a strong economy for. In which case, they’d likely have to start easing significantly in the second half of this year. There’s also a potential for the trade war to get settled. We are entering election season after all and the President has made it pretty clear how important the stock market’s performance is to him. And then there’s also the little-noticed changes going on at the margins which I’ve been discussing recently. 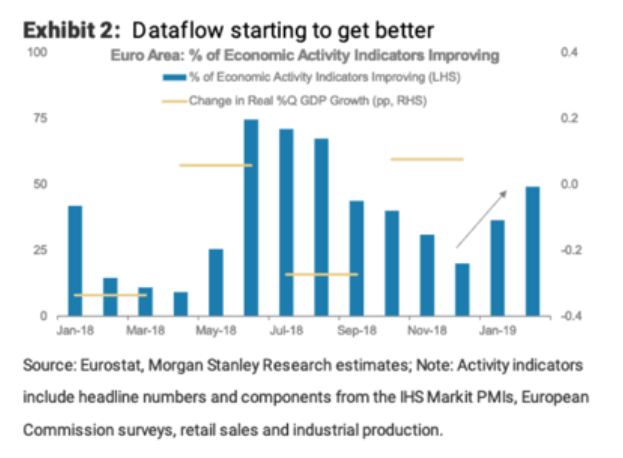 There’s the possibility that the atrocious econ data in Europe bottoms soon. At least for a while. After all, we are about to see the biggest fiscal boost our of Europe in a decade (charts via MS). And European dataflow is already beginning to slowly improve. Turning to the US, we are seeing some slowing growth. But our confluence of recession indicators are not flashing red, as of yet. 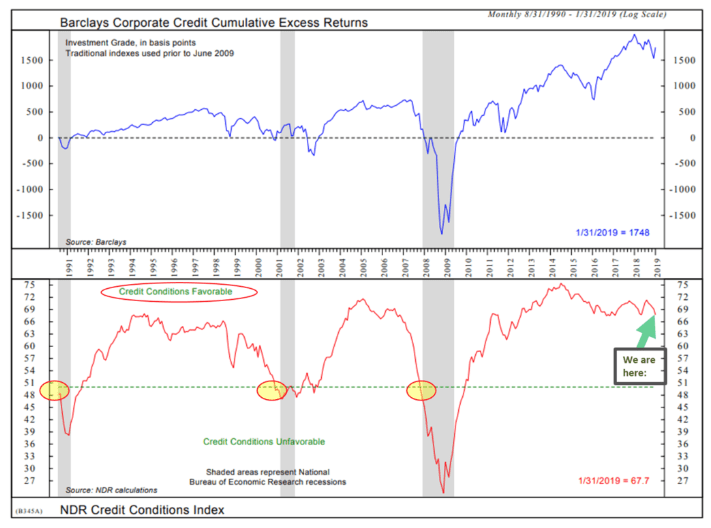 NDR’s Credit Conditions Index (via CMG Wealth) shows that credit conditions are near cycle highs and a loooong ways off from signaling recession. 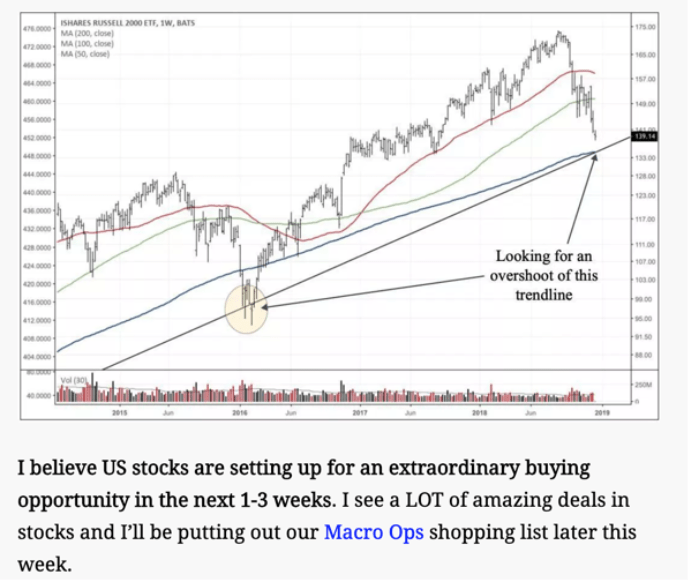 I understand that this may not be a very popular take — which means it’s more likely to be true — but I think the current macro conditions continue to set up to be extremely bullish for stocks. Note that I say stocks and not the economy. Remember, the two are not the same. 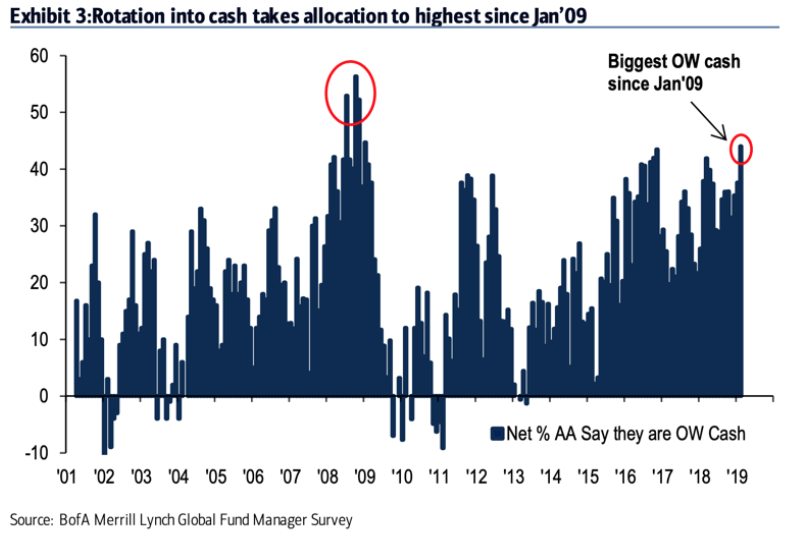 Fund manager cash holdings are the highest they’ve been since January 09’. 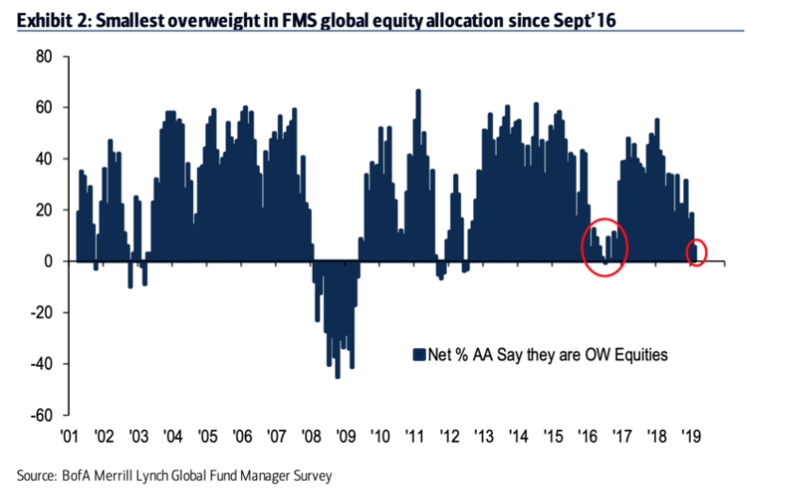 Their allocation to equities are at some of the lowest levels this cycle. I think it’s pretty clear where I think it is. I’m not trying to gloat here. I get things wrong ALL the time and don’t mind doing so. That’s not the game I’m playing. I’m playing the game of making money, not being right. I personally love this kind of feedback to my work. It means I’m onto something. I have a feeling this piece will invoke similar cries of hysteria. Especially when the market moves a little lower in the week(s) ahead. 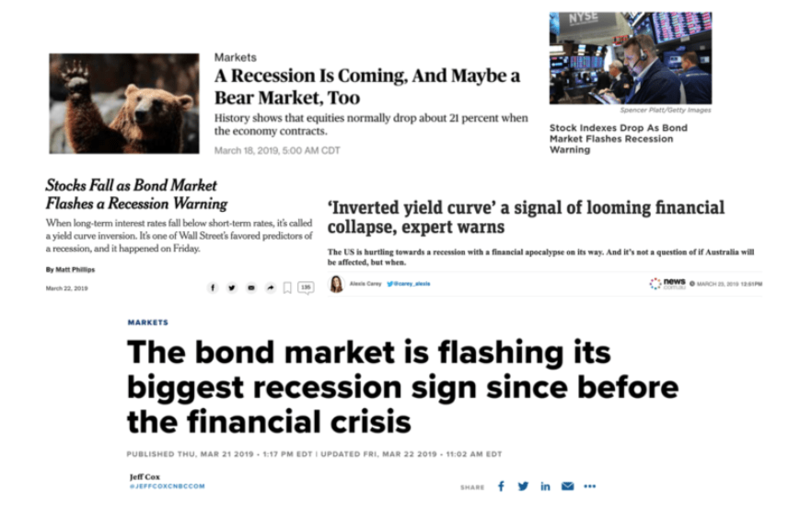 The market will be talking about the yield curve inversion, collapsing growth, and a coming recession. But I’ll be focusing on flush liquidity, a solid Fed put, and a normal technical pullback that was easy to spot (see chart below showing semis on the weekly piercing their upper BB. A move back down to around the orange line is expected). While most will be selling into the hole, we’ll be looking to add to our risk in a number of areas of the market where we see extraordinary asymmetric opportunities. So, yeah… This time IS different and the world probably isn’t coming to an end. 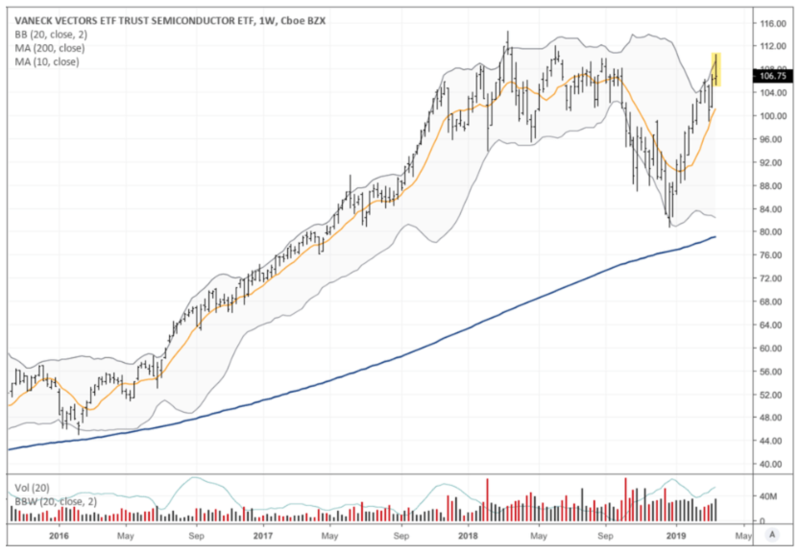 If you’ve been offsides on this year’s face-ripping rally then you may want to use the coming small pullback as a chance to get back in. 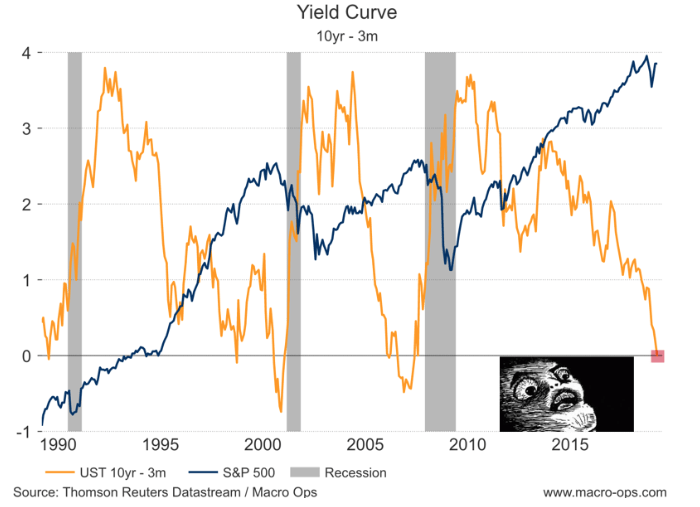 I’ll be updating this yield curve narrative weekly inside of the Macro Ops Collective. If you would like to see how my team and I are positioning into the summer click the link below to join our premium community. I hope to see you in the Collective. Just click the link below, and scroll down to the bottom of the page to join our amazing community of macro traders from all around the world.